It's heartwarming to see what a close bond our former Housemates still have with one another. It only makes us even more excited for what's on the way. A brand-new season of BBNaija is on the way with mere weeks remaining before the madness kicks off once again. Brace yourselves for unexpected twists, drama and chaos as a new crop of Nigerian men and women battle it out for three months in hopes of walking away 45 Million Naira richer! There were so many strong personalities last time around which inevitably lead to a lot of clashes. While this made for some fantastic television it's also worth acknowledging the profoundly positive impact it had on our Housemates who had learn to compromise and expand themselves. That's probably the reason why so many of them are still so close as is evidenced by the way they re-united for the holidays. Let's take a look. READ: Big Brother Naija Season 3 Start Date Confirmed!! Uriel invited the whole gang over for Christmas and in no time they were up to their hilarious antics with laughter ringing all round. After she got evicted one of the things everyone missed was Uriel's amazing food so it was only right that she treat her friends to what we're sure was a scrumptious Christmas dinner. Everything got captured on the gram including a priceless moment when Bisola forgot to grab her wig and get photo ready. "Gipsy Juriel" flew out to London a few days later and despite the bitterly cold weather she's been out and about shopping for everything from ingredients for Nigerian delicacies to designer clothing and perfume. She's even scoping the talent on the local scene. Ese celebrated Christmas by just being her fun, crazy self. We hope her manicure is still intact after the fire work stunt she pulled. She also gave us flashbacks of her epic, dancefloor routines when she teamed up with her sister for a one-minute dance party. 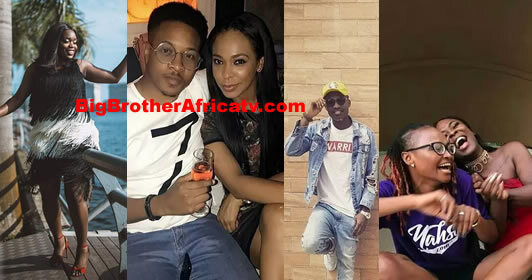 Fellow "fake Housemate", Jon Ogah got people talking with a couple of suggestive snaps on his IG after celebrating the New Year with TBoss "and friends". We're going to fight the urge to be spicy and leave it to you to decide what's really going on here. That said, we still think they'd make a gorgeous couple. I mean, can you say, "genetic gold mine?" Ebuka clearly has no plans to stop slaying us in the new year! He celebrated the dawn of 2018 at a friends wedding looking dapper as ever before winding down and spending quality time with the people that matter most. For Debie-Rise the grind didn't stop during the festive season as she rang in the new year with a brand new album titled 'R.A.G.E' (short for: Rise Above General Expectations). Nonetheless, she got in on the festive spirit by treating her thousands of fans to previews of the entire EP and we're loving what we've heard so far. How did you celebrate the holidays? We're also keen to know how you're finding 2018 so far. Drop us a message on social media using "#BBNaija". While you have a think about that, we'll leave you with Bisola's take on the year so far. Spoiler: "E don HOLD!"